Blimp flown over Helmdon to indicate the height of the five turbines proposed in the Broadview Wind Farm. Sulgrave Parish Council have obtained information following the recent exercise to illustrate the height of the proposed Wind Turbines at Spring Hill Rise. As shown in the above picture, the turbines would dwarf the previously highest local man-made landmark, the viaduct on the former Great Central Railway. 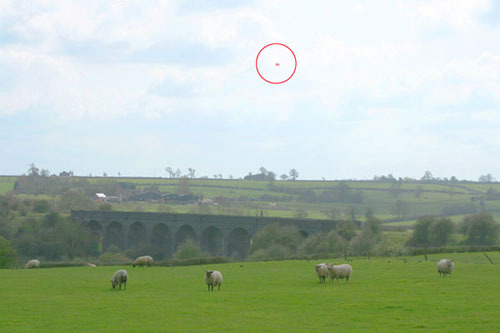 The blimp was well seen from many places in Sulgrave and its height verifies a calculation which suggests that the view of the turbines from Castle Hill Scheduled Ancient monument would probably be as shown below. The blimp also demonstrated that the turbines would be intermittently seen from various roads, footpaths and public areas in the village such as Castle Green. Houses in Church Street and Little Street with windows facing southwards would almost certainly have their views dominated by the five turbines. It should be noted that these turbines would be approximately 2.5 kilometres from the village whereas the nearest turbines in the Enertrag scheme would be as close as 850 metres and so would appear to be three times higher in the landscape to the east of the village. This information was provided by SWWAG, Sulgrave Parish Council have agreed to publish the information without prejudice as it is regarded to be in the public interest. This entry was posted on Sunday, April 25th, 2010 at 7:25 pm	and is filed under News. You can follow any responses to this entry through the RSS 2.0 feed. You can leave a response, or trackback from your own site.